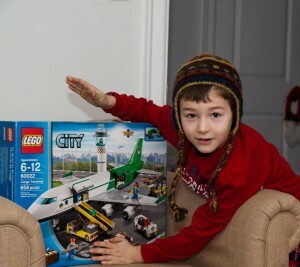 Evan got a new Lego set for his birthday – and Canadian Feed The Children got $85 from Evan towards our Canadian programs. To celebrate his eighth birthday, Evan invited his friends to a party full of fun and games. But when it came to the gifts, Evan wanted to do something for children less fortunate than himself and his friends. “I wanted to have a party, and do something special for others. My mom asked me a few questions about who I wanted to help. I wanted to make sure kids everywhere have enough to eat,” said Evan. With that in mind, Evan’s parents picked Canadian Feed The Children as the charity of choice. Evan’s party guests all brought lovely handmade birthday cards with thoughtful messages and birthday wishes. And, thanks to Echoage–an online birthday party service–Evan was able pick out one special birthday gift (a Lego set) for himself AND give a gift to children who need so much more. Evan’s party raised $85 in support of Canadian Feed The Children’s domestic programs.